Hide deals from seller "Mrs. Ames Professional Psychic"
Hide deals from category "Psychics & Astrologers"
Limit 2 per person. Valid on a psychic reading. Includes tarot and palm readings. Available in person or by phone. Palm reading not available by phone. By appointment only. Promotional value expires 60 days after purchase. Soothe your worries about the future when you use this deal for 52% off a psychic reading from Mrs. Ames Professional Psychic in Palatine ($25 value). This thorough reading includes both a tarot card and palm reading, and each reading has no time limit. Mrs. Ames acquired her psychic gift from her mother and has been practicing for more than 35 years. She uses her knowledge and skills to help you improve the quality of your life through spiritual healing. Mrs. Ames can provide guidance for current and future situations, and can help you achieve happiness and balance for your mind, body and spirit. Along with palm readings and tarot readings, Mrs. Ames offers spiritual cleansing, energy crystal readings and chakra balancing. Ease your psyche with this spiritual offer. 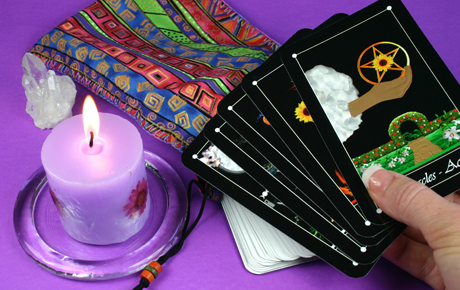 Psychic in Palatine offering palm readings, chakra balancing, spiritual cleansing and more.